This is one of the best thrillers of the seventies. 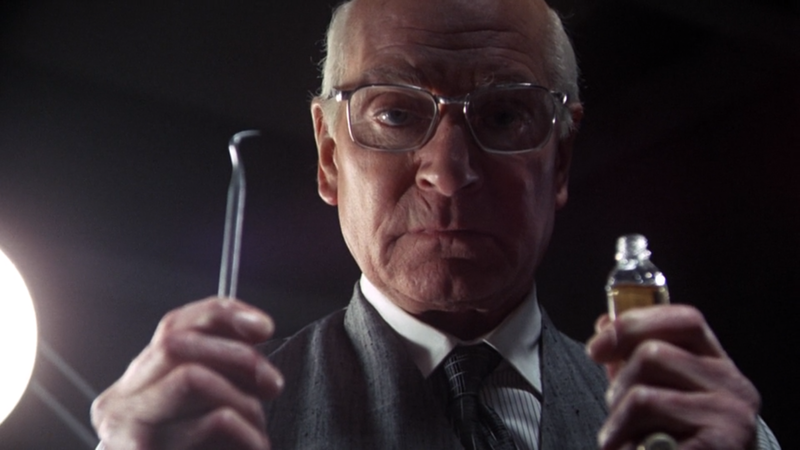 Marathon Man is a very impressive movie. It combines the tonal grit of the mid-seventies with an immersive story to become a film that is still really effective all these years later. By taking the Hitchcock formula and placing it in a gloomy urban setting filled with graphic violence and characters with fluid loyalties, this movie would become a huge influence on several generations of suspense stories that would follow. 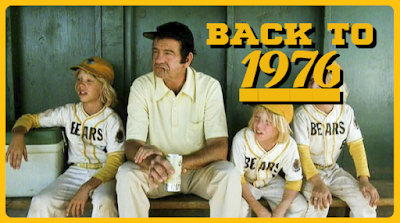 Part of what I admire about this movie is that it does a lot of things that are unconventional and that modern audiences wouldn’t tolerate, but these surprising choices are a big part of what makes the seventies such a special decade for film. It was a bold decade filled with staggering decisions when filmmakers were eager to challenge the status quo and established formulas. For example, it’s at least an hour into the film before we really have an understanding of what movie we’re watching. Director John Schlesinger (1969’s Midnight Cowboy) throws us right into the intrigue, and there are a bunch of scenes that don’t really seem to connect until later in the picture when we finally understand what we’re watching. Even then, we’re given everything we need to know in an exposition dump that lasts for about thirty seconds and isn’t repeated. If a viewer isn’t paying attention, they’re lost. This is a bold choice that requires patience and faith from the audience, but we are rewarded for giving both. There is no hand holding. This movie demands our attention in a way that feels rare and challenging even by seventies standards. Another thing that’s unconventional is the casting of Dustin Hoffman as the lead of the film. Marathon Man is a suspenseful story of espionage with sudden outbreaks of violence and multiple pursuit sequences, and we’ve been taught to expect the lead in such a film to be a towering, muscular hero, or at least a handsome leading man such as Cary Grant in North by Northwest. 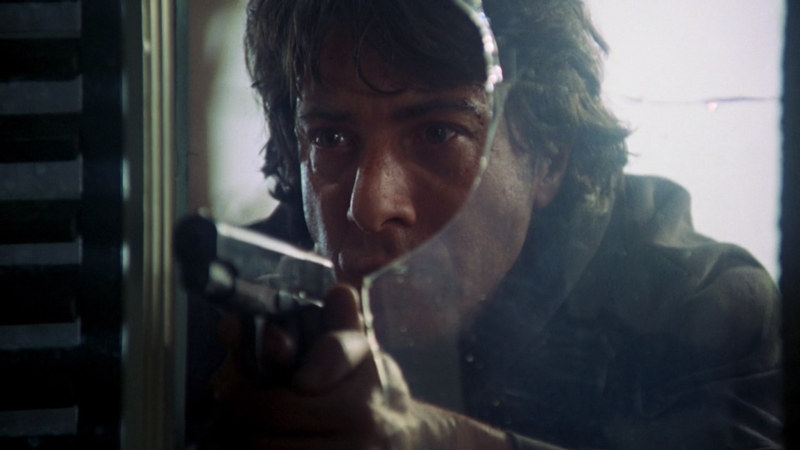 Dustin Hoffman is the exact opposite of that model, but that’s all part of what makes this so riveting. I have kind of a hard time with Dustin Hoffman; there’s something about him that rubs me the wrong way, but this movie seems to be completely aware of this and addresses it in the film. Hoffman’s neighbors have nicknamed him “Creepy,” and by acknowledging Hoffman’s off-putting qualities, they’ve taken away one of the barriers of entry for the viewer. The actor was also nearly forty, so he looks more like a professor than a student, but somehow, remarkably, it works because the movie doesn’t pretend that he’s an attractive young man. This movie predicts our reservations and nullifies them so that we have nothing to take us out of the film. Roy Scheider co-stars as Hoffman’s cooler older brother, a well-travelled man of mystery who fends off assassins in Paris, has clandestine meetings in the dark, and is a complete mystery to his younger sibling. Scheider fits more in line with who we expect to see in a seventies thriller, serving as our traditional action hero until the movie informs us that it has other plans. This was Scheider’s follow-up to the previous year’s blockbuster (the first blockbuster?) Jaws, and his casting was done intentionally to elicit a sort of heroic confidence from the audience that the movie eagerly subverts. Rounding out our trio of leading men is Sir Laurence Olivier, one of the most accomplished thespians to ever walk the boards in English theater. Just as with Hoffman, I’m often turned off by performances that draw too much attention to themselves, and Olivier is one of those actors famous (or notorious) for his technique and method of disappearing into a character with the aid of makeup and different voices, a la Johnny Depp. I find all this exhausting more often than not, and it reminds me of Jon Lovitz’s “Master Thespian” character from Saturday Night Live. “ACTING!” And yet, the movie once again anticipates my distaste and makes Olivier’s performance so incredibly engaging that I can’t help but be riveted. The actor plays someone who is himself acting, a Nazi and a war criminal attempting to hide in plain sight as a normal, elderly man. There is nothing ostentatious about the performance; in fact, Oliver makes this horrible little man almost sympathetic. This movie is always a few steps ahead of our expectations. Marathon Man is an example of a slow burn, meaning that it’s a movie that takes its time by setting up all the pieces so that they can fall like dominoes. It’s tempting to think the film is decompressed and lethargic in the way it sets everything up, but retrospect shows that nothing we’ve seen is unnecessary. Hoffman’s romantic interludes with a foreign student, played by Marthe Keller (1977’s Bobby Deerfield) seem like a diversion, but they aren’t. Everything we invest in this movie is paid off. Like other films of the decade, this movie is shocking in how far it goes and how much it is willing to show. The seventies were a new age for cinematic violence, with films like Dirty Harry, The Godfather and Jaws turning up the dial of what could be shown explicitly on screens. This movie cranks things up even further by delivering more extreme violence, but it’s maybe best known for a dental torture scene that is legitimately horrible. A captive Hoffman is assaulted by a dental drill and the noise alone is enough to keep people away from the dentist office for the rest of their lives. The violence, the discomfort, even the pervading sense of a tightening noose are all elements that make this movie riveting, but also very hard to watch in all the right ways. There is a wonderful musical score, but it’s used sparingly at first, only turning into something more epic as the circumstances escalate. In true seventies fashion, some of the most suspenseful and cringy scenes in the entire movie don’t have any music in them at all but play out in silence. When the score does come, it often has synthesizer embellishments within it, and I love the combination of symphony with synth. Similarly, the cinematography becomes more and more iconic as we speed toward the conclusion. Just as Hoffman doesn’t really have any scope for what’s happening around him, the visuals, notably from Hoffman’s perspective, don’t feel “big” until the story hits high gear. Then the frames become filled with iconography that feels epic and overwhelming. This is all lensed masterfully by Conrad L. Hall, the cinematographer who won Oscars for his work on Butch Cassidy and the Sundance Kid, American Beauty, and Road to Perdition. I recognize that I’m probably gushing here, but I think Marathon Man is a rare perfect storm of gritty seventies aesthetic, tension that never lets up, and great performances that feel real and not showy. There are a lot of elements that I haven’t even mentioned, like the fantastic turn by William Devane (Payback, Interstellar), and actor that I really love to watch. Marathon Man is a movie that fires on all cylinders and is a great example of what a thriller can accomplish. I mentioned earlier that I think this film has influenced generations of suspense stories that have come after it. I see elements of Marathon Man in the Jason Bourne movies. David Fincher’s underrated thriller The Game seems to take a large number of its tricks from this film. I don’t think that Marathon Man invented any of the storytelling methods it employs—we can thank Hitchcock and the great noir films of the forties and fifties for that—but it does wrap it all up in a grimy aesthetic that feels less like Hollywood and more like our own urban backyard. In doing this, it places the tension at our own doorstep. Even all these years later, it remains a taut, squirm-inducing suspense masterpiece, and one of the best films from 1976. 70s movies are truly in a genre into their own. I remember when I was first getting into film, 70s movies were difficult for me to penetrate. You just sort of watch events unfold without the usual plot signifiers. When I did make it to this one I had fallen in love with those type of movies and thus I fell in love with Marathon Man.